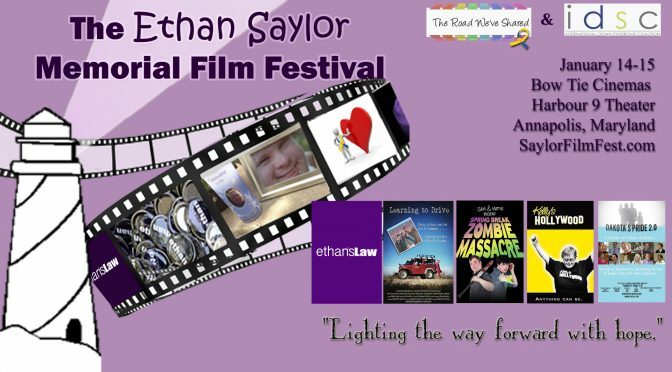 Annapolis, MD, October 24, 2016 – The Road We’ve Shared and The International Down Syndrome Coalition (two organizations who advocate for and with people with Down syndrome and their families) are hosting the first annual Ethan Saylor Memorial Film Festival to mark the fourth anniversary of the death of Ethan Saylor, a resident of Frederick County, Maryland. Saylor died in an altercation with three off-duty Frederick County Sheriff’s Deputies when he refused to leave a movie theater. In the struggle that ensued once the deputies decided to arrest him, Saylor ended up on the floor, handcuffed, with a crushed larynx. The coroner ruled his death a homicide, but after an internal investigation the grand jury refused to indict the deputies. The purpose of the festival is to 1) honor the life and legacy of Ethan Saylor and 2) celebrate the contributions of people who have Down syndrome as actors, film creators, and interesting subjects/participants in documentary films. Films from across the U.S. will be a part of the festival. • Ethan’s Law – The feature length documentary directed by Edward Rhodes (Martinsburg, WV) will be the keystone of the festival in this our inaugural year. The film tells the story of one family’s unimaginable tragedy and the legion of supporters that formed around them determined to create change and prevent future, avoidable deaths. • Montgomery County native Connor Long stars in the short film written and directed by Roderick Stevens – “Learning To Drive” – inspired by the true story of a spirited young man with Down syndrome determined to convince his caring but distracted brother to teach him how to drive. • Two young men who raised nearly $70,000 on Kickstarter to fund their film have recently been interviewed by Time and Conan O’Brien among others. Sam Suchmann and Matthew Zufelt wrote and starred in the dramatic short “Spring Break Zombie Massacre” which will be part of the festival. • “Kelly’s Hollywood” is a dramatic documentary told from a sibling’s point of view. Filmmaker and actor Brian Donovan tells the poignant story of his relationship with his sister and their quest to fulfill her dream of becoming a Hollywood diva. • In the follow-up to the award winning PBS documentary “Dakota’s Pride,” producer and father Girard Sagmiller revisits those he spoke to in his quest for the truth about Down syndrome ten years ago in “Dakota’s Pride 2.0”. The festival will be held on January 14th and 15th, 2017 at the Bow Tie Cinemas Harbor 9 Theater in Annapolis, Maryland. Organizers are now seeking sponsors and accepting submissions of feature length and short films, as well as entries for their “Future Film Makers Contest” and online auction. Tickets will go on sale next month. For more information, please visit our website and join our Facebook event to stay up to date with all of the latest announcements.